Do come and sing with us! “Dear friend, we are happy to announce that you have been selected by the International Jury to take part in the World Youth Choir session….” The dream has begun! You probably wonder why I start this article with such a peculiar sentence. Well, it is hard to explain, actually, and hard to understand either if you are not a musician or a choral singer. Wherever you live, whatever your citizenship, the name of your country, the color of your skin, none of those things is important; they all disappear immediately after reading the sentence above. The name World Youth Choir changes everything, makes details of your origin irrelevant! I first read that sentence from the World Youth Choir management in 1999. I keep remembering it and asking myself, how many times have I received it? How many times has this simple, innocent phrase changed my life? 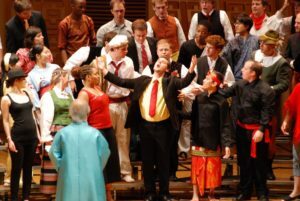 What is the World Youth Choir and why is it so important to us musicians – singers, choral lovers, conductors, international youth, in short, the global choral world? Well, I will try to explain it to you. One thing is certain, you will be surprised and provoked; you will want to receive the same sentence in your inbox; you will wish to see and hear us live, to have one of our CDs, to follow us on the net, to organize one of our sessions, to host us in your country or region. You will wish to support this genuine idea in every possible way. So, when you are done reading, make a decision and you will experience ‘the world’ of music, humanity, multiculturalism, and equality. You will be in the world’s largest choral wonderland for youth. You may ask, who am I and why am I writing this? Well, my name is Vladimir Opacic, former World Youth Choir singer and current World Youth Choir project manager. Why do I write this to you? Because I was and still am happy, living the Word Youth Choir dream. That introductory sentence has reached me four times in my life. It changed my perspectives in 1999, coming from a country at war at the time, living under bombardment for three months, without permission to cross any borders. From that moment on, I observed the world with different eyes; the sentence enriched my life with different people, cultures, languages, styles, and music…basically everything. It taught me friendship, independence, respect, patience and professionalism. It ‘educated’ me (and still does) while singing at eleven summer and winter sessions, representing three different countries…first Yugoslavia, then Serbia and Montenegro, and last Serbia. It is funny, but actually irrelevant when you are living this project. I became and still am a citizen of the world thanks to the World Youth Choir. History disappears there. Boundaries and politics are not part of this world. 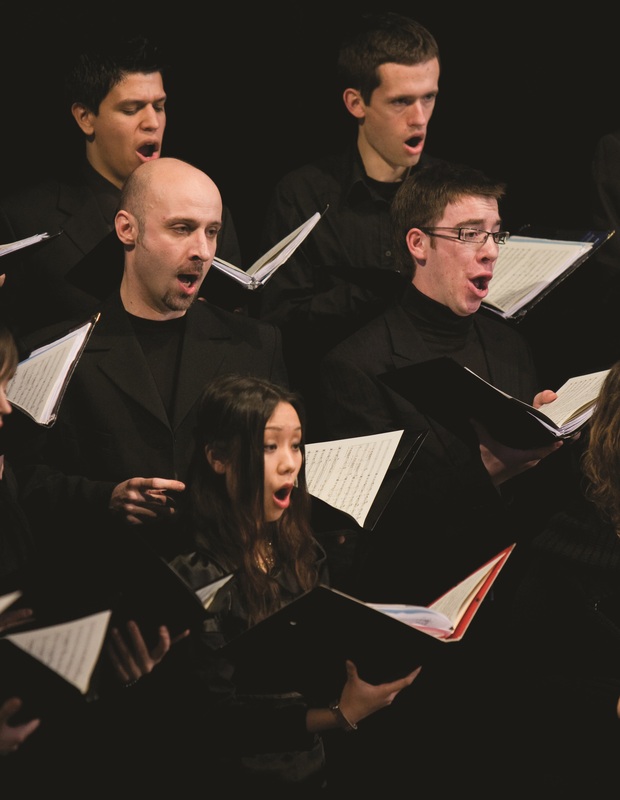 People who sing and perform together share a unique experience and a unifying feeling that comes from the common ambition to create musical expressions and achievements. These feelings are something that can never be taken away from you. Communicating through music, through singing, is something that can reach deep within us and touch issues that neither singers nor audience members can express in words. The actual and symbolic value of gathering together young and highly skilled singers from all over the globe, creating these great musical performances, combined with all the energy and enthusiasm of the young musicians, cannot be overestimated. People ask me how I can describe the project, its message, goals, and history, its importance for myself, my friends and the global choral community. You can not actually. You need to live it. It is hard every time…especially if you want to skip the ‘facts’ and be a bit creative in order to reach the sophisticated souls and minds of musicians, to provoke them to read the text to the end. But let me try. Many articles and reports have been written, many stories told, many video and audio files recorded and presented to the world in the past twenty-three years. And then there’s the philosophy of the ensemble, its value from the artistic, social, pedagogical and human sides. There is always the question of how to present the various past and present projects and events of this wonderful human, social and professional choral experience, how to describe this ‘child’ born in 1989 from a group of choral lovers and enthusiasts, led by the ideas of equality and historical quest for multicultural diversity. Diversity is the peace of our souls. Our immune system is made of tolerance; an unimaginable creation global society is striving for. It is an inner legacy, given to all of us by birth, to be found during our short lives and serving to balance our outer selves and our deep inner selves. To be used for our development, for our professional and human goals. Diversity has been the ‘land’ of the World Youth Choir for twenty-three years, a ‘land’ with ‘skies’ made of the most wonderful, youthful sounds of the international choral repertoire, ‘landscapes’ of high artistic achievement, ‘mountains’ of world-renowned choral leaders and conductors, ‘clouds’ of artistic and organizational professionalism, ‘nature’ of most profane and sensitive human personalities, ‘colors’ of youth from all over the globe. The ‘land’ without borders is all of us who have lived in it these past twenty-three years, more than 800 young singers, conductors, organizers, recruiters, choral enthusiasts, with borders made of dreams and beyond dreams, speaking the language of the cultural simplicity of each of us. And there it is. Simple lives; a global network of singers, conductors, fans, and audiences in every corner of the globe; two decades of living the World Youth Choir dream – and still dreaming it. 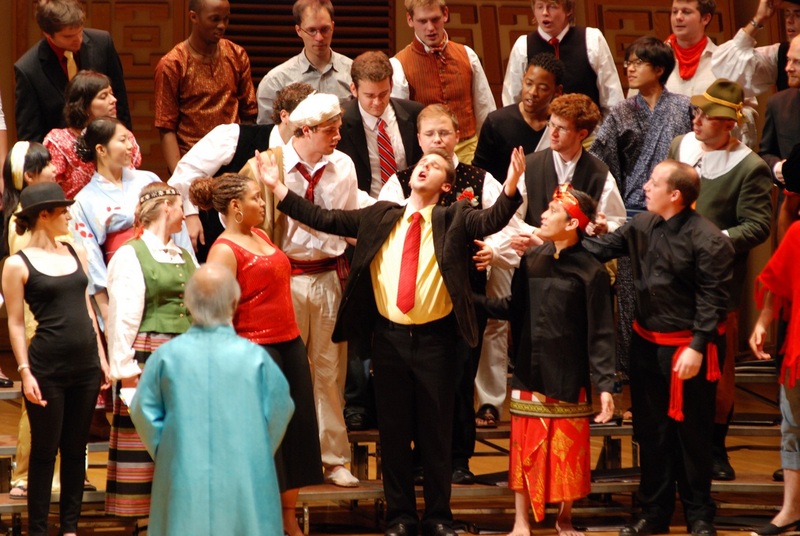 The World Youth Choir is one of the most original and important choirs in existence today. 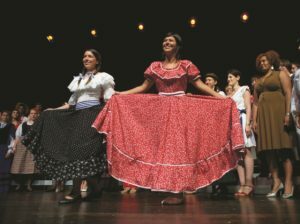 For 23 years, it has built bridges between young singers from diverse cultures, offering them a genuine educational and social experience drawing on many vocal traditions and aiming at the highest artistic level. This phenomenon is unique in the world of music. Comprised of young singers between the ages of 17 and 26, the World Youth Choir is original in concept, bringing together talented young singers from all over the world to summer or winter sessions organized in a different country each year. Artistically speaking, it is a unique experience for young singers to develop their musical and vocal talents by interacting with internationally recognized conductors and performing challenging repertoires at a professional level. In a social context, the World Youth Choir contributes to the raising of new generations of ‘Citizens of the World’. Many of the countries represented in the choir and repertoire emphasize the World Youth Choir as a school of understanding between different cultures, people, music and traditions. Beyond the artistic project, which in itself is a major achievement, the World Youth Choir represents a unique experience in personal relationships for its members. Regardless of political or cultural differences, approximately 100 young people with a common passion for music and a love for singing share one month of life together, thereby allowing work, play, conversation and debate. 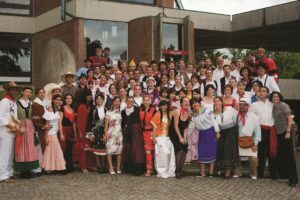 This community life creates a genuine spirit of friendship, a group with a unique cohesion and vitality that amaze those who attend World Youth Choir concerts. Without speeches or banners, the World Youth Choir provides its message of music, and by its presence, its message of international peace, brotherhood, and the vitality of life itself. This is the reason why UNESCO honored the project in 1996 with the title ‘Artist for Peace’, recognizing its double mission, social and artistic; its success as a platform for intercultural dialogue through music. 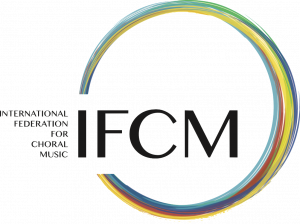 The World Youth Choir is sponsored by the ‘International Federation for Choral Music’, IFCM (www.ifcm.net), ‘Jeunesses Musicales International’, JMI (www.jmi.net) and ‘European Choral Association – Europa Cantat’, ECA-EC (www.eca-ec.org). The World Youth Choir: a remarkable synthesis of ideas, action, enthusiasm, devotion, and youth; past, present and future. What do the social and political imperatives of healing and peacemaking have to do with singing in a choir? Just about everything. Thinking of the World Youth Choir, past, present and future, its recruitment partners, singers, conductors, session organizers, and faithful audience, I realize how blessed we all were, are and will be to live this experience. If you have never attended any World Youth Choir projects or if you are not a musician and especially a choir singer, you can not truly understand the meaning of these words. For 23 years the World Youth Choir has proudly demonstrated through its sound and presence why UNESCO honored this project with the title ‘Artists for Peace’ in 1996. I believe this legacy will remain in the minds and souls of generations of singers to come. 2011 – World Youth Choir performs at the Nobel Peace prize award giving ceremony, Nobel Peace Prize concert, and the final concert of the 200th celebration of the University of Oslo, Oslo, Norway. Each summer the World Youth Choir, comprised of half new, half re-invited singers, meets in a different country of the world for two weeks of intensive rehearsals of a new repertoire with two different conductors and contrasting programs. This is followed by a two week tour through the host and neighboring countries, presenting their music in major concert halls and prestigious cultural centers. During the Tour, the choir seeks to enhance its social and pedagogical mission by interacting with local schools, choirs and the population in general in order to share THE WORLD with them through master classes, workshops and clinics. Sometimes the World Youth Choir meets during the winter as well, for sessions with strong pedagogical impact on singers, through specially chosen repertoire, focusing on different epochs in the history of music; or meets for projects based on special invitations for annual or major world events. The World Youth Choir has been privileged to perform in more than thirty countries around the globe under the baton of world renowned conductors: Anton Armstrong, Frieder Bernius, Filippo Maria Bressan, Michael Brewer, Peter Broadbent, Bob Chilcott, Peter Dijkstra, Peter Erdei, Eric Ericson, Gunnar Eriksson, Gary Graden, Georg Grün, Maria Guinand, Aharon Harlap, Florian Heyerick, Felipe Izcaray, Sidumo Jacobs, Robert Janssens, Tonu Kaljuste, Eric Klaas, Anthony Leach, Eduardo Mata(†), Albert McNeil, Denis Menier, Theodora Pavlovitch, Grete Pedersen, Johannes Prinz, Robert Shaw(†), Ole-Kristen Ruud, Fred Sjöberg, Stefan Sköld, Paul Smith, Robert Sund, Ward Swingle, Nobuaki Tanaka, Andre Thomas, Jonathan Velasco, Michele Weir, Hak Won Yoon, Steve Zegree, Johan Duijck, Ana Maria Raga, Ragnar Rasmussen and Josep Vila I Casanas. 1989 – Sweden; 1990 – Belgium; Sweden; 1991 – Hungary; 1992 – Spain; 1993 – Norway; 1994 – Uruguay and Argentina; 1995 – Canada; 1996 – Estonia, Latvia, Finland Sweden; 1997 – Japan; 1998 – Taiwan; 1998/1999 – Winter session, Belgium; 1999 – Slovenia; 1999/2000 – Winter session, Belgium; 2000 – Spain; 2000/2001 – Winter session, Belgium and South Africa; 2001 – Venezuela; 2001/2002 – winter session, Belgium and Italy; 2002 – United States of America; 2002/2003 – Winter session, Belgium; 2003 – Switzerland; Austria, Slovenia; 2003/2004 – Winter session, Belgium and France; 2004 – South Korea, Japan; 2004/2005 – Winter session, Belgium; 2005 – Israel; 2005/2006 – Winter session, France; 2006 – Italy, France, Switzerland, Belgium; 2006/2007 – Winter session, Belgium, Germany; 2007 – South Africa and Namibia; 2007/2008 – Winter session, Belgium, Netherlands, France; 2008 – Hong Kong, Macao and mainland China (Guangzhou); 2009 – Belgium, France; 2010 – Canary Islands, Balearic Islands and Iberian Peninsula; 2011 – Oslo, Nobel Peace Prize ceremonies. The World Youth Choir is open to all interested singers from around the globe between the ages of seventeen and twenty-six; are passionate and highly experienced choral singers or soloists; have a basic or semi-professional music education; are ready to accept the diversity of world cultures; are eager to learn in a multicultural environment; seek a different professional knowledge and are ready to spend one month with great people, meeting new friends and world-renowned conductors. Applications for a live audition are made available by national recruitment organizations in September of the year before each planned session (where no possibility exists for an audition in one’s home country, apply directly to the World Youth Choir management; more info at www.worldyouthchoir.org). If selected by a national jury, singers receive the right to represent their country before an international jury panel, where the final selection of singers is made. There is no participation fee. Chosen applicants (after an international audition) only have to cover their own travel expenses to and from the host country. Since the end of 2010, the World Youth Choir has been is run by the World Youth Choir Foundation, with a new head office in The Hague, The Netherlands, which was set up with support from the Choir’s three patron organizations. The Foundation will be responsible for the future of this magnificent ensemble, for the young singers who would love a ‘piece of the cake’ and for future session organizers who would like to experience, live, everything the World Youth Choir represents. From where I stand today, I see that the project has evolved, and all of us have evolved with the project, but some things stay the same all these years: the artistic quality, the wide spectra of the most challenging international choral repertoire performed by the World Youth Choir with the highest musical interpretation, and the singers with their passion, their personalities and the diversity of their cultures. Simple, young, pure human beings, unspoiled by the modern world they live in! They are the thread which connects the past with the present and ensures the future. That is why many of us, more than eight hundred singers since 1989, come back every year. The World Youth Choir was our ‘runaway’ shelter, a world we have dreamed of, a world to be educated in, to grow up in, and a place to become better musicians, professionals, or at least, better human beings, The singers’ souls are rich with talents that ‘oil’ this machine and ensure it will never stop. Well dear ICB reader, I hope you have understood what the World Youth Choir project means for all of us who had a chance to live it, for all our faithful recruitment partners in more than sixty countries, for the singers who have auditioned over the past twenty-three years, for all musicians privileged to create unique musical and social moments with the ensemble, for all organizers who had a chance to host ‘the world’ in their respective countries. Interested? Provoked? Would you like to join? Would you like to be part of the next generation of World Youth Choir singers? 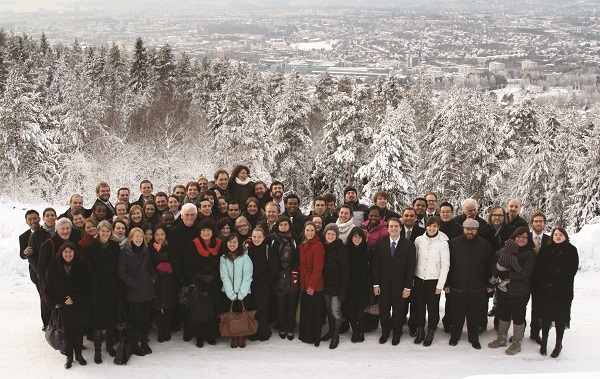 Would you like to host the World Youth Choir in your country in 2013 and beyond? Visit www.worldyouthchoir.org, read more and contact us. Although the World Youth Choir is already mature, we will stay as youthful as we are today. Here’s to all our futures.